Xerox is known around the world as a global leader in document technology and services. Xerox’s Global Manager of Content Marketing, Greg Pings, is responsible for the company’s twelve blogs, and is charged with finding solutions to common platform problems. One of Greg’s major initiatives is increasing traffic across Xerox’s blog portfolio. Audience Targeting – Putting targeted calls to action in front of different users, in order to drive key business metrics. Sharing Buttons – Providing an easy solution for social sharing and distribution of Xerox’s online content. Follow Buttons – Making it easy for people to find and follow Xerox across all their different social media platforms. Greg implemented AddThis Audience Targeting tools with the goal of capturing more email addresses from readers so that Xerox could increase blog traffic through email campaigns. After just one month of using Audience Targeting, Greg captured 540% more email addresses than his prior monthly average. In addition to significantly growing email lists, Greg wanted to increase the number of Xerox’s white paper downloads. To promote a recent report, Greg used Audience Targeting to push blog visitors to a page where they could download the report. The Audience Targeting rule Greg created earned Xerox 118% more downloads of the report than the paid search campaign he was running to promote the report. After seeing such strong results from using AddThis Audience Targeting tools, Greg successfully encouraged his colleagues to implement Audience Targeting across two more of Xerox’s 12 blogs. 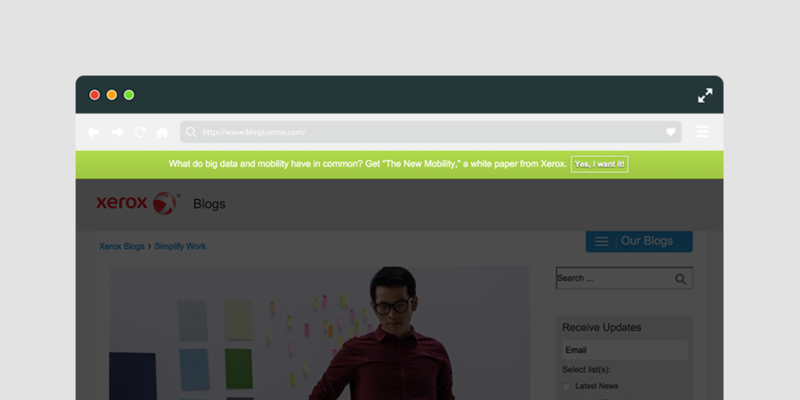 In addition to Audience Targeting, Greg also implemented AddThis sharing and following tools on Xerox’s blogs. These tools have helped Greg achieve increased social distribution across the board. “They add a multiple of sharing that you just can’t ignore,” said Greg. It’s easy to start generating results like Greg’s with our easy-to-use website engagement tools. Join AddThis and get started today!